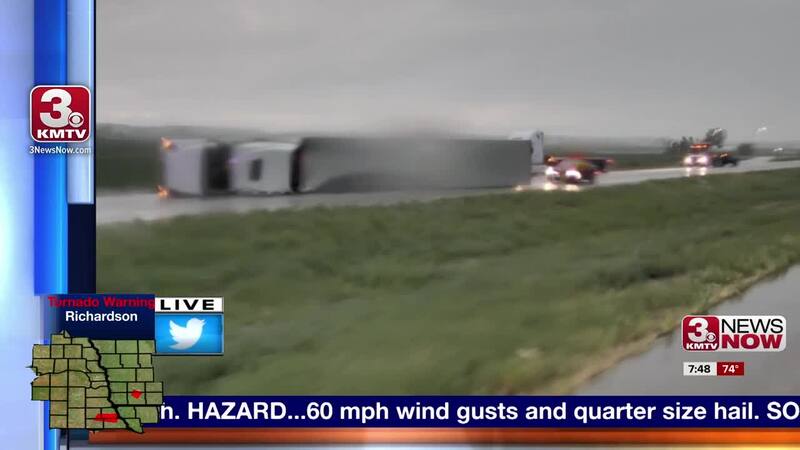 Semi trucks were blown off Interstate 29 near Thurman, Iowa. Fierce winds, hail, and rain slammed Fremont, Louisville, Plattsmouth and surrounding areas as tornado warnings were issued as Monday's storms rolled through eastern Nebraska and western Iowa. Near Thurman, Iowa , at least six semi-trucks were blown off Interstate 29. In Fremont County, Iowa, there were reports of trees down and power outages. Authorities were looking into reports of damage to post office in Sidney, Iowa, also trees down. Power is out in parts of the town right now. Several Nebraska counties including Douglas, Cass, Dodge, Saunders, Sarpy, and Washington as well as Pottawattamie County in Iowa were in tornado warnings as the storms circulated into eastern Nebraska and western Iowa. Winds of 100 mph were reported. At 7:30 p.m. Monday, OPPD was reporting about 1,500 people in Cass County were without power . Spotters reported a funnel cloud touchdown during the first tornado warnings near Fremont. Hail and straight-lined winds also affected residents in these areas. Stay with 3 News Now for the latest weather updates.